I’m so excited to write this post today. Recently, I visited my friend who has absolute great taste and a good design eye. I’m always looking to refine and train my eye (my current space is so not reflective of what I can do! When I have my own home, I’ll be sure to give you all a tour :). 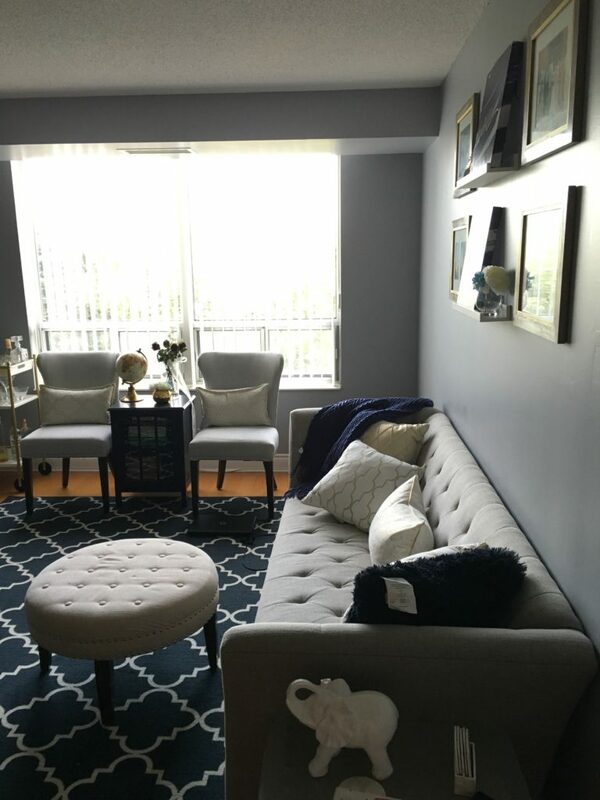 Back to my friend – she lives in a 2 bedroom condo and has styled her entertaining/living room space into a stylish and comfortable oasis. Tip 1: Choose 4 main colours that complement each other. 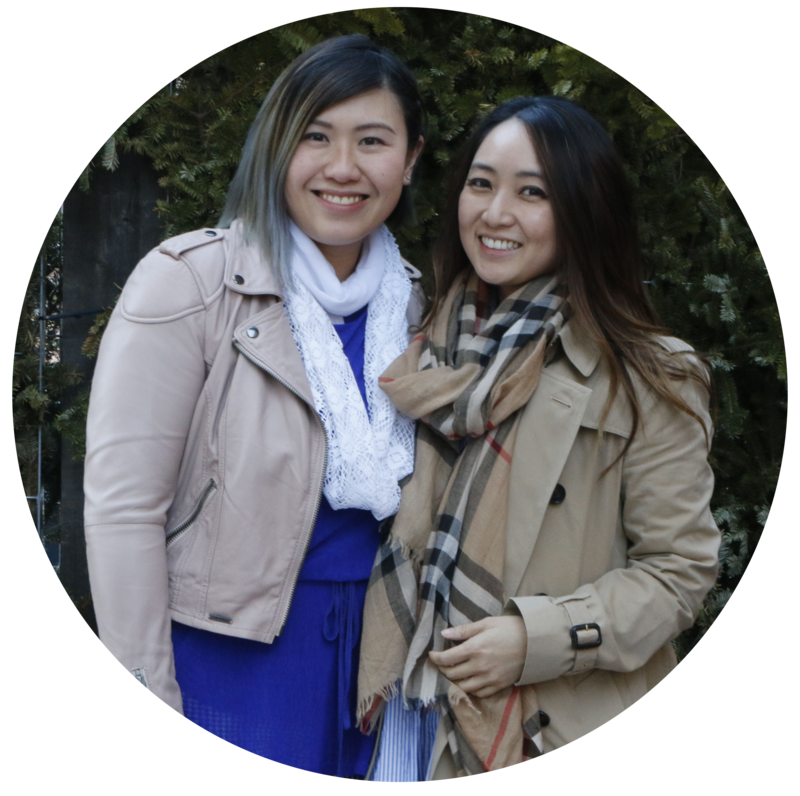 Too many would take away from cohesiveness. Her main colours are: Gold, white, grey and navy. Tip 2: Spray paint an item in a different colour if what you’ve picked up doesn’t go with your theme. Or make an item to have a different purpose than it was originally built for. 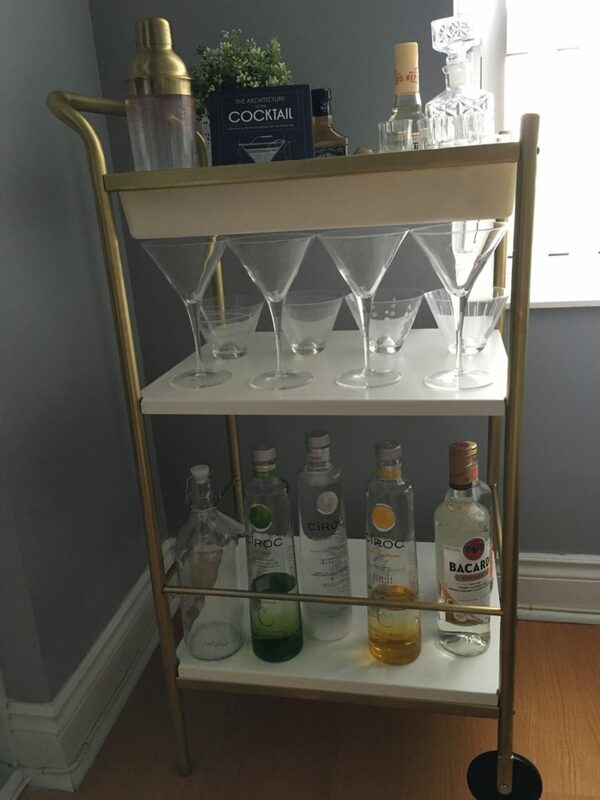 An amazing bar cart! I love it. 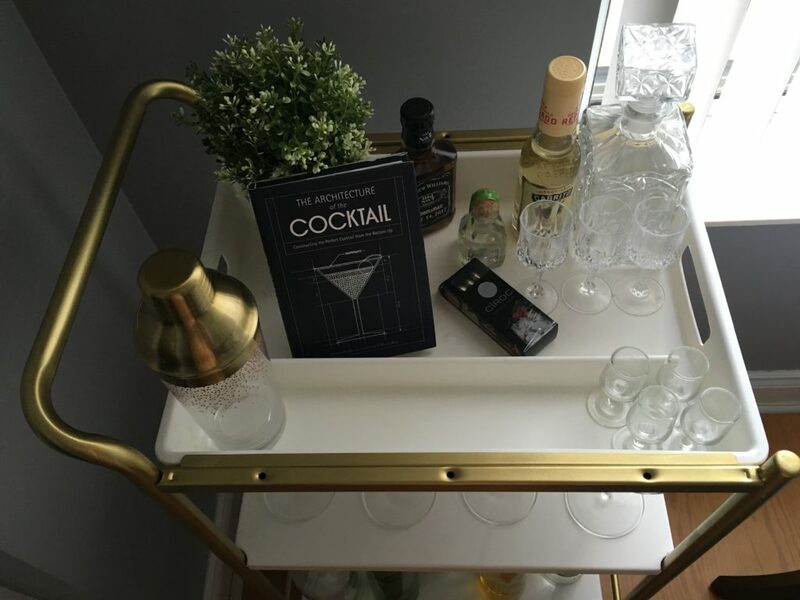 She spray painted this gold – it wasn’t originally a bar cart but she made it into one 🙂 Love the glassware and different liquor she displayed. 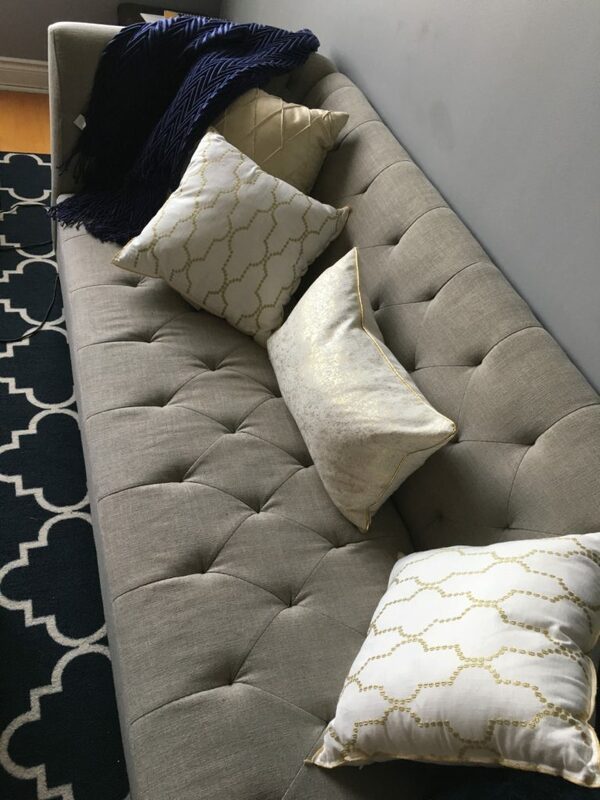 Tip 3: Choose pillows of varying textures and designs that still go well together. Don’t be afraid to check online sites for better deals. Cute throw pillows on a very comfy couch! 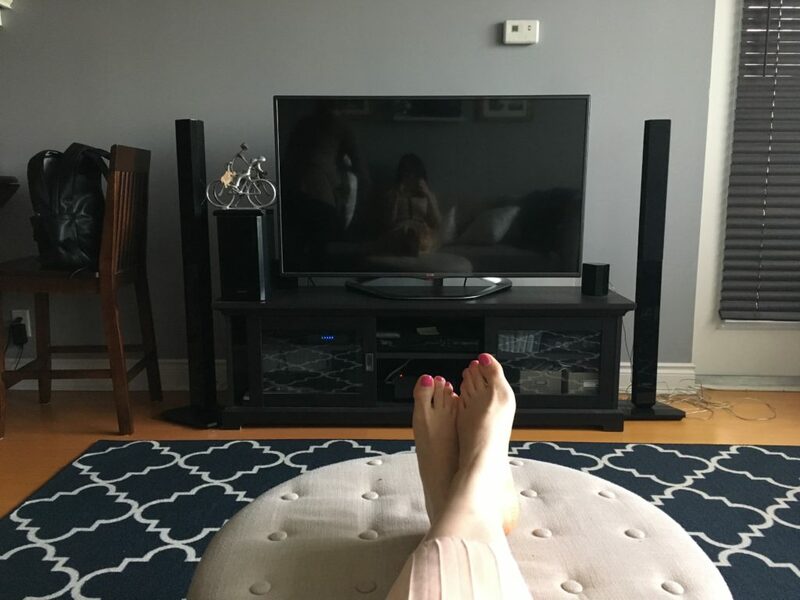 She scored the couch on Kijiji – she’s really good at amazing finds, this one. Tip 4: Make sure the walls are in a colour and shade that go with your furniture and decor pieces. And don’t forget about the flooring. Tip 5: Put on display what and who’s most important to you. 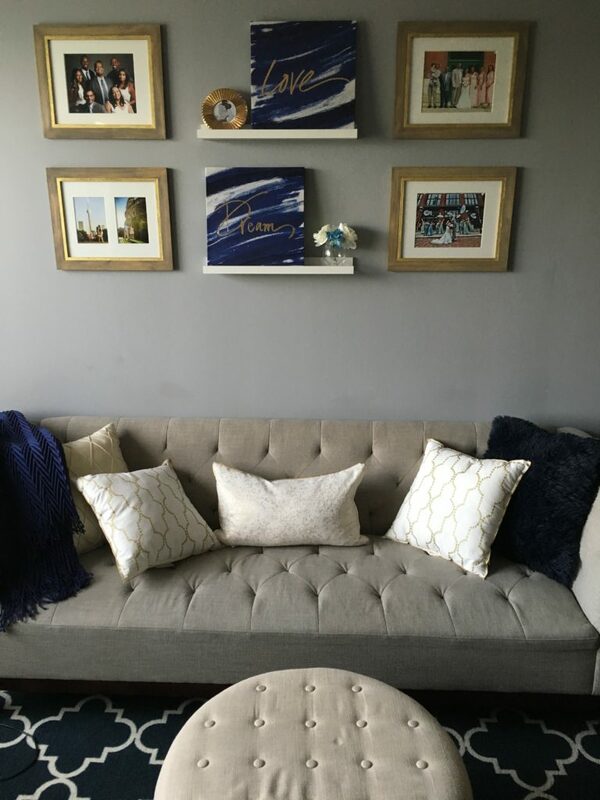 Tip 6: Make your space comfortable, unique to you and one that you look forward to being in everyday! And this is me… resting comfortable on her couch with my legs propped on a lovely ottoman. I think an ottoman is a piece that is often overlooked. It’s actually a very important piece and it should be in every home!